Firestone Audio Spitfire review | What Hi-Fi? 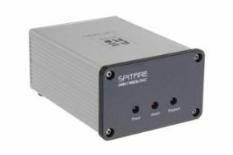 This is a very simple product, with a 24-bit Burr Brown DAC inside, and just optical and coaxial inputs on the back, along with the standard stereo RCA output for connection to your amp. So no, the Firestone doesn't have a USB input, but you can still connect a computer via optical if it is so equipped (laptop headphone sockets often double-up as mini-optical connections). Otherwise you'll be looking at using the Spitfire in partnership with a digital dock, CD transport or music streamer. Do so, and you'll be rewarded with excellent sound. Play Broken Bells' eponymous debut album, and you're treated to a wonderfully full-bodied, solid and deep-reaching delivery. The leading edges of notes are excellently defined, but not at the expense of the organic, melancholic pacing. Overall timing and tonal balance are very impressive, and where some rivals create greater separation to instruments, a comparison with our reference hi-fi system proves the Firestone's focused, cohesive delivery to be the more accurate. The only slight flaw in the presentation is a smidge of hardness to lower treble. However, because this is only occasionally noticeable, and because higher treble is nicely controlled, we're not going to mark the Spitfire down. In fact, so long as you don't need USB, this is the pick of the affordable DACs.